The Global Inventory and Systematic Evaluation of Perennial Grain, Legume, and Oilseed Species for Pre-breeding and Domestication (for short: Perennial Agriculture Project - Global Inventory (PAPGI)) is a collaborative effort of Saint Louis University, the Missouri Botanical Garden, and The Land Institute (Salina, Kansas). The project aims to develop a comprehensive searchable database for identification and evaluation of perennial, wild, herbaceous species in the Asteraceae, Fabaceae, and Poaceae families. Perennial species are valuable for agriculture because they offer deeper rooting depths, reduced erosion risks, greater interception, retention, and utilization of precipitation, and improved ecosystem functioning relative to annual species (Jackson 1980; Glover et al. 2010). We envision this database will be useful for botanists and agricultural scientists. For botanists, this site provides descriptive information including taxonomy for perennial members of three of the largest known plant families. For agricultural scientists interested in developing perennial, herbaceous grain, legume, or oilseed crops, the PAPGI offers detailed information including data relevant for breeding such as reproductive biology, economic botany, and toxicology. In the long term, the PAPGI will generate a checklist of perennial, wild, herbaceous species in the Asteraceae, Fabaceae, and Poaceae. In addition, through the collection of detailed information on taxonomy, growth descriptors, ecology, reproductive biology, genetics, economic uses, and toxicity, PAPGI aims to identify perennial, wild, herbaceous species with potential to be developed into perennial crops for use in perennial polycultures that mimic natural ecosystems (Jackson 1980). The innovative approach of the PAPGI is to bridge plant biodiversity science with the agricultural research. 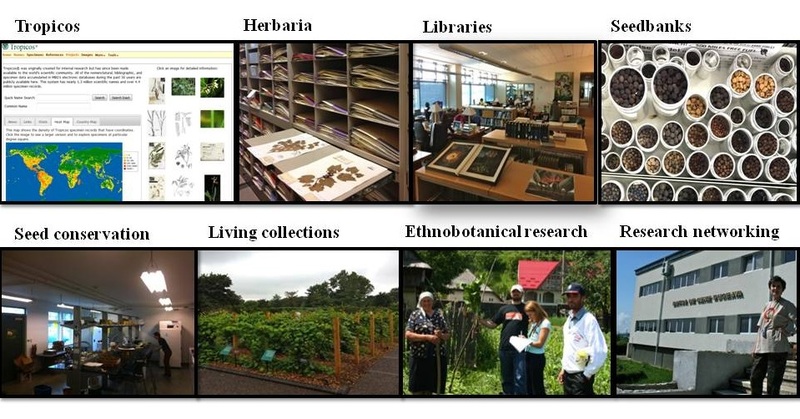 This project merges specimen-based information from Tropicos and other botanical databases, with data from various sources including specimen based herbaria, floras, wild germplasm inventories, conservation catalogs, and scientific publications. The PAPGI is organized such that within Tropicos, each of the three families (Asteraceae, Fabaceae, and Poaceae), genera including perennial members, and perennial herbaceous species has its own taxonomic page. Each wild, perennial, herbaceous species will have a page where traits are described. The horizontal Menu Bar provides access to taxonomic search functions in Tropicos, while the vertical Navigation Bar links allow browsing Families, Genera, Species and advance search options within the PAPGI. The advanced Search Builder option generates species lists based on specific keywords attributes selected from the check box options. The Perennial Agriculture Project Global Inventory is a work in progress. Information within this project is being updated regularly. For additional information or questions please contact Allison Miller, Wendy Applequist and/or Claudia Ciotir. Ciotir C, Townesmith A, Applequist W, Herron S, Van Tassel D, DeHaan L, Crews T, Schlautman B, Jackson W, Miller A. (2016 onwards). Global Inventory and Systematic Evaluation of Perennial Grain, Legume, and Oilseed Species for Pre-breeding and Domestication. [http://www.tropicos.org/Project/PAPGI: month, 2016]. Missouri Botanical Garden, St. Louis, Missouri, USA. Glover JD, Reganold JP, Bell LW, Borevitz J, Brummer EC, Buckler ES, Cox CM, Cox TS, Crews TE, Culman SW, DeHaan LR, Erickson D, Gill BS, Holland J, Hu F, Hulke BS, Ibrahim AMH, Jackson W, Jones SS, Murray SC, Paterson AH, Ploschuk E, Sacks EJ, Snapp S, Tao D, Van Tassel DL, Wade LJ, Wyse DL, Xu Y (2010) Increased Food and Ecosystem Security via Perennial Grains, Science 328: 1638 – 1639. Jackson W (1980) New Roots for Agriculture, University of Nebraska Press, Lincoln, NE, USA.